Low-cost oil delivery and worry-free heating service. Talk to us. Chances are good you’re paying too much for your oil and heating service. Did you know that that every oil company—large or small—pays almost the same price for a gallon of oil? Did you also know that “free” service is never free, the cost is usually “hidden” in your price per gallon. And because larger companies have greater overhead, they have to charge more per gallon than we do. With smaller overhead, and a new way of doing business, we can save you a bundle–on the exact same oil and service as the big guys. As a homeowner who heats with oil, you probably care most about 3 items from your fuel delivery company. 1. Will they provide reliable delivery of oil so I never run out? 2. Will they take great care of my system and be there for me when I have a need for service? 3. Will I be charged honestly and fairly for oil and service? 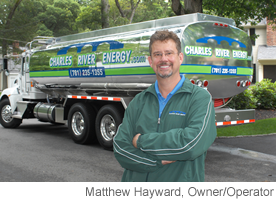 If I could guarantee you YES to all three questions, would you be interested in learning more about Charles River Energy? We're saying YES; we guarantee it.